Held as a tribute to the late balladeer Sean McCarthy, the Sean McCarthy Weekend Festival celebrates the best of Irish traditional music. This year’s festival opens with a concert from Sean Keane with Fergus Feely and Pat Coyne and continues with ballad competitions, the bog walk, lively trad sessions, art exhibitions, and a festival BBQ. 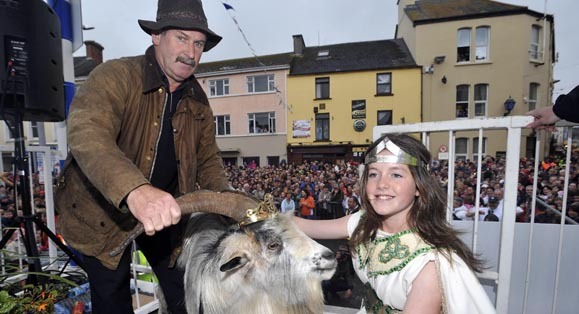 The only festival we know of that crowns a wild goat as king for four days, Puck Fair is not your usual event. More than 400 years old, it features fun for all the family, with street entertainers, music day and night, workshops in everything from Irish dancing to circus performing, markets, funfairs, and spectacular fireworks. Originally a competition to find the young woman most suited to wear the tiara of the Rose of Tralee, the Rose of Tralee International Festival is now much more than that. Of course, the high point is the Rose selection in the Dome, but there is plenty of fun to be had across the week of the festival. If you enjoyed Jake Carter at Puck Fair, you can also catch him in Tralee. From the black-tie Rose Ball and the glamour of the Rose of Tralee Fashion Show to nightly concerts, street entertainment, market stalls, funfairs, and fireworks, the Rose of Tralee International Festival really ends summer in Kerry on a high note. What’s your favourite August event in Kerry?